Cycling's popularity in the UK continues to surge. With Chris Froome winning his third Tour de France and Britain aiming for 8 to 10 cycling medals at the Rio Olympics, it's no surprise people are being inspired to take up the sport. 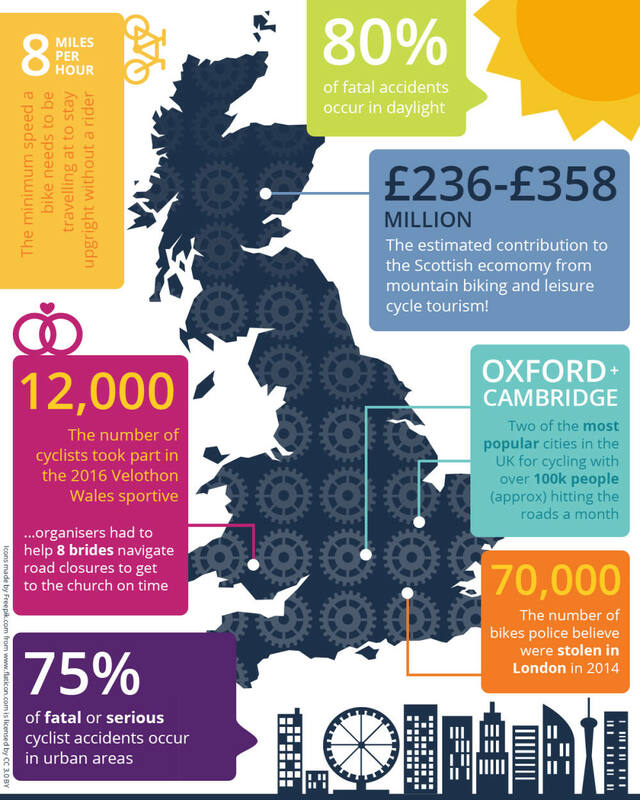 The rise in riders is producing lots of fascinating facts and stats about British cycling. Bought By Many has produced an infographic map to illustrate some of the data and other weird and wonderful cycling trivia. Some of the data highlights the need to protect yourself while in the saddle. That can be through safety and security equipment such as helmets and locks, but you can also use insurance to cover yourself in case the unexpected happens. We've teamed up with PedalSure to offer our members 10% off cycling insurance. They offer cover for yourself, your bike or both. It includes payouts for medical expenses if you do get injured and theft. You can join our groups for city cyclists, commuters, mountainbikers or new cyclists to unlock the discount. This graph shows UK Google search trends for the word 'cycling' since 2004. Every year it peaks during the Tour de France and there was a huge spike in 2012 when the Great Britain team won 12 medals at the London Olympics. PedalSure covers most bike brands. If your bike is not on the list, don't worry, these are just the most popular. You can join one of our cycling groups to get a personalised quote with 10% discount. Join Bought By Many to receive a 10% discount on cycling insurance.